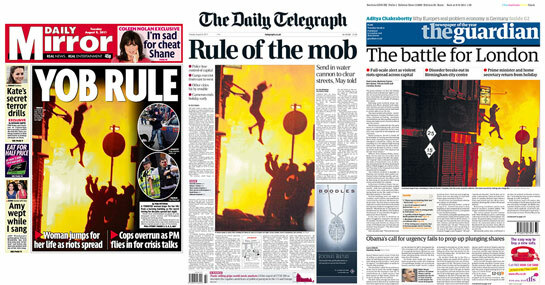 2011 Riots – How does the recent history of law and order policy help to explain the official reaction? How does the recent history of law and order policy help to explain the official reaction to “the riots” of August 2011? On the 4th August 2011 Mark Duggan, a 29 year-old black man, was shot and killed by police in Tottenham, North London. The following day, at 5pm, 300 people walked from the Broadwater Farm estate where Duggan had lived to Tottenham police station calling for “justice”. At 8.20pm two police cars, left unattended on an adjacent street, were attacked, set alight and “the riots” began. For the four days that followed “feral youth” roamed the streets of London, terrorizing its citizens, trashing and looting high streets, torching buildings. The most televisual of events, perfectly suited for the age of 24-hour news, this was, at least, how “the riots” were portrayed in the mass media. This, as it happens, was also how Britain’s political leaders saw them. Obliged to return prematurely from their summer holidays, the Prime Minister and his deputy, the Home Secretary, the Leader of the Opposition and London’s Mayor were beseeched by the media to facilitate the restoration of order, to supply answers and, later, to provide suitable reparation for the victims and punishment for those responsible. Even as the fires burned, social commentators and stakeholders sought to influence, desperate to be first to provide the definitive explanation for the unrest. Online and in newspapers, opinion pieces covering the broadest imaginable spectrum of judgments were published; the same or similar figures were afforded radio and television airtime to “explain” the causes for the riots; still more heated debate ran rampant online. All “answers”, whether tonally punitive or moralistic, despairing or sympathetic, of press or politician, were united by one thing: preordination. In the days during and immediately after the riots the explanations massively exceeded the availability of facts that might be thought essential to inform them, yet precisely served the political outlook of those that provided them. Crime and law and order policy in the UK, once an issue for experts and academics and free from outside influence and interference, is no longer characterized by reflection, investigation and study. Instead the approach, of both the political and the mainstream media class, is based upon reaction, rapid response and a rush to the retributive right. The sense that public policy and expertise have become largely removed from each other is hardly new and far from revelatory. The savvy politician seeking to be “successful” is more aware than ever that success in politics does not necessarily mean getting the policy “right” but is as much to be found in mobilizing the support of both the media and the electorate – often viewed as one and the same. While some eagerness to appeal to public and media support can be found in all areas of policy-making, in none has the distance between expertise and political decision-making become greater and more visibly enshrined and institutionalized, than in the realm of law and order. Just as Pontius Pilate deferred to a baying mob in the sentencing to death of Jesus Christ, so we find today’s leaders doing the same, as manifested in the popular press and mass media. The difference, as I will demonstrate, is that while Pilate demonstrably goes against what he knows and believes, the alignment between the views of our politicians on law and order, and those of the baying mob is all but total: no resistance is needed; no internal wrangling need take place. The question is not, therefore, how much consensus is there between the different and disparate stakeholders, but how did such a comprehensive convergence occur at all? As the consensus amongst criminologists appears to be that the turning point came in the early years of the 1990s, this essay will look most closely at the relevant events and issues of the start of that decade. I will then discuss the contributions these can be seen to have made to the policies and rhetoric of government officials, and opinions of key media figures in response to the riots. While the timing and occurrence of the riots themselves were impossible to predict with any precision, over the course of this essay I intend to demonstrate that the rhetorical and judicial responses could have been scripted months, if not years, in advance. My goal here is not to offer my own response to the riots of August 2011, but to demonstrate that the official response, while intellectually inadequate, was utterly predictable and subservient to the demands of politics, the public and the press. On the morning of Tuesday August 9th, after three nights of unrest in Britain’s capital, Prime Minister David Cameron arrived back in Britain declaring the riots to be “criminality pure and simple. And there is absolutely no excuse for it.” For Cameron “the young people stealing flat screen televisions and burning shops that was not about politics or protest, it was about theft.” Deputy Prime Minister Nick Clegg similarly declared the rioting to be “needless, opportunist theft and violence – nothing more and nothing less”, while London’s Mayor described the events as “acts of sheer criminality” . The political verdict that the violence was the act of “criminals” and “criminal gangs within the urban underclass”, riots without reason, was in close step with that of the mainstream press. The newspaper The Sun’s editorial of August 7th stated that “The mob that turned the centre of Tottenham into a smoking ruin were not seeking justice. They are criminal thugs who were hell bent on theft, arson and violence.” For the popular press the answers as to “why” the riots occurred were simple and easily identified, with no need for further exploration into “root causes” and certainly no call to understand the situations of the rioters themselves. For Professor John Solomos of City University the popular verdict suited very much [into] the Government’s requirement that any particular policy or action/inaction of their own not be viewed as a significant contributing factor to the riots: “Cameron was keen to use this notion to distance the violence from any policies initiated by his administration and to construct them as the outcome of a breakdown of morality and a sense of order in some families and communities.” In other words, it needed not to be seen as result of governmental failings requiring governmental solutions. With no significant pressure placed on them to do so, the government was therefore able to dismiss/ignore any solutions that could be considered “welfarist” in nature, regardless of the merits of doing so. Instead emphasis and attention was afforded to the area most easily actioned, that of punishment, with the Prime Minister declaring “if you are old enough to commit these crimes, you are old enough to face the punishment.” Prison sentences handed down to individuals convicted of riot-related offences were reported as being 25% longer than normal and the rate of imprisonment was 70% higher for those crimes that took place within the context of the riots. A senior clerk in Her Majesty’s Courts and Tribunals Service was reported to have circulated instructions to court clerks that they should disregard normal sentencing guidelines and instead impose tougher sentences than usual. The government was evidently eager to send a message, not simply, or even really, to those involved in the riot but to the media and to the greater public. Stafford Scott, a consultant on racial equality and community engagement, has said that “seeing the riots as linked to criminality and gang culture has made it difficult to give voice to calls to provide more social and economic resources for the communities that live in the most deprived areas”. In a so-called time of “austerity”, when community services are not just not increasing but being cut, this represents not merely a political inconvenience – it would be portrayed as rewarding the rioters – but an economic one as well. The rioters, rather than being given too little, had been given too much and expected even more. The answer could only be penal: punishment as deterrent rather than as a right response or execution of justice. The answer was to respond better next time, to provide the police with more resources and broader, stronger powers to act. While government for most of the 20th century was characteristically “welfarist”, in Britain in the 21st century it is politically suicidal to be seen as anything less than “tough on crime”. Next I shall be looking at how this situation came about. While the government might have been keen to isolate the riots and the rioters from any political context, to minimise the intellectual and investigative scope of the response, we are not obliged to do the same with our analysis of the response. Far from unusual or unlikely, the government behaved exactly as could have been predicted, with the ramped-up rhetoric and raised-stakes of the sentencing instructions epitomising the character of cross-party criminal policy of the past twenty years and more. While sociologist David Garland points to the 1970s as the time when the public and political mood changed, as several decades of welfarism gave way to a vastly more punitive governmental approach to crime, Lord Windelsham and Jon Silverman separately identify the early 90s as marking the period when law and order policy became a key political battleground, with public and media opinion overtaking expertise as an influence on political practice. Ann James and John Raine, similarly, ascribe the transformation to a shift in ideology under Margaret Thatcher which saw the welfare consensus replaced by the culture of the market and government adopt a neo-liberal managerial approach. Garland notes that a number of features of law and order policy that would once have been thought unlikely if not impossible, such as “mandatory sentences, victims’ rights, community notification laws, private policing, “law and order politics” and an emphatic belief that “prison works”… have become taken-for-granted features of contemporary crime policy”. For most of the twentieth century the British (and to a lesser extent, the American) approach to law and order, had been characterized by the directionally developmental march of institutionally “penal welfarist” arrangements. He therefore finds it counter-intuitive that it should perform an about-turn in the 1970s when “punitive sentiments and expressive gestures” that appear “oddly archaic and anti-modern” began to reappear in official policy. One crucial element was the normalisation of crime. Although the riots were themselves far from ordinary they were, in some ways an exaggerated form of a negative experience which we have come to accept as ordinary and therefore part and parcel of day-to-day living. In that vein, we do not think of crime as something that the government (in the form of mobilised police resouces) can really prevent, not entirely, nor do we see crime prevention at a social level as something into which it is worth investing resources. It is, instead “a fact of modern life, like pollution or the perils of heavy road traffic that has to be accommodated.” We have, ourselves, become as responsible for crime prevention as the police. Paradoxically, while this sense of the limited capacity of government to control or reduce crime has been allowed to develop, democratic electoral politics still do not allow for its admission. This contradiction has, according to former government minister Lord Windelsham, led to “the emergence of punitiveness as a reaction which can be exhibited to the general public even if, in anything beyond the short term, it is likely to exacerbate the social blight caused by such extensive criminality.” For Garland “[a] show of force against individuals is used to repress any acknowledgement of the state’s inability to control crime to acceptable levels. A willingness to deliver harsh punishments to convicted offenders magically compensates a failure to deliver security to the public at large.” Windelsham similarly describes such posturing as demonstrated by David Cameron on August 8th as nothing more than “a rhetorical smokescreen”. Lord Windelsham, in his dissection of the politics surrounding the 1993 Criminal Justice Act, points to it as a pivotal moment in the gradual and extended transfer of primary influence over criminal policy. This is not to say that the responsibility for this shift – from experts and institutions to the media and the public – lies solely with politicians, but that a degree of accommodation from key figures – such as Ken Clarke’s retreat over a number of contentious aspects of this bill – are seen as some of the earliest and most significant examples of politicians altering law and order policy in the light of sustained and strident popular pressure to do so. From here on, Windelsham argues, “greater reliance on punishment and heightened sensitivity towards public opinion were soon to emerge as the central planks of a radically reconstructed policy towards criminal offending.” In his tenure as Home Secretary Michael Howard, was viewed by both Windelsham and Jon Silverman – the BBC’s former Home Affairs correspondent – as having been responsible for the greater politicization of law and order policy, for bringing it more into the public realm and further away from the influence of academics and institutional experts. Windelsham describes Howard as being “generally dismissive of professional expertise, including at times advice from his own officials, sensing that the general public was looking for a greater emphasis on punishment than on the rehabilitation of offenders”. This he was more than willing to deliver and Silverman similarly identifies Howard as being a man of politics before policy, in contrast to predecessors such as Willie Whitelaw and Douglas Hurd. For Michael Howard “Everything was political. Crime was a big political issue because it resonated on the doorsteps and for him, if you made an impact on crime, you made an impact on politics.” Ascribing to Michael Howard a large share of the responsibility to prioritising public perception might be to give him undue blame (or credit). He may or may not have been the one who “fired the starting pistol which set off the penal arms race between the parties” and would ultimately lead to what academic Michael Tonry describes as “the most hyperbolic, anti-crime rhetoric of any in Europe, language that elsewhere characterizes right-wing fringe parties”. Looking back it is clear that the dash that would lead Britain to the populist, authoritarian right would have happened irrespective of whether Michael Howard’s Conservative party decided to join it. Tony Blair, as Shadow Home Secretary and subsequently as leader of the Labour Party and Prime Minister is seen as just as important a protagonist. The 1992 General Election defeat triggered a sea change in the Labour Party’s approach to law and order. Under Blair “Labour adjusted its traditional libertarian stance and style of political discourse on crime and punishment to suit the hardening political mood.” That Blair’s “tough on crime, tough on the causes of crime” should become one of the most resonant political catchphrases of the subsequent generation is as much to do with the signal it sounded for the national popular and media approach to law and order, as it was a war cry that would lead ultimately to Downing Street. As criminal policy was becoming, for the first time, a serious electoral battleground, Blair identified the importance of avoiding being “outflanked on the right” – he might not have expected to win the battle, but it was one that it was crucial not to lose outright. Garland is deeply critical of the politicization of law and order policy and what he describes as “the new populism”, in no small part because, where often politicization is accompanied by positional polarity, penal politics has meant a “narrowing of debate and a striking convergence of the policy proposals of all the major political parties”. Cameron, as he struck out rhetorically at the “thugs” and “criminal gangs”, promising “more arrests” and accelerated court processes, could do so with impunity. By 2011 in Britain, when it came to law and order policy, there was no such place as too far to the right and no room for a liberal perspective. This path was one that the Government, in response to the riots, would prove more than willing to follow as anti-intellectual catchwords such as “common sense” rode roughshod over information and expertise. Criminology has become an academic discipline that serves only itself, with little influence on policy and political positioning. As law and order policy has become a major political battlefield, expertise and academic study has been displaced by the media as a political resource. That little or no reference was made to academic studies of crime, or expertise in criminal behaviour does not mean that such information did not exist, or could not be commissioned, merely that the political interest in it, with regard[s] to the riots, does not. One such paper was published before the riots in 2011 and which sought to explore the – long assumed – relationship between inequality and rioting. This study ultimately found that, rather than inequality causing riots, a lesser privileged group was more likely to commit violence only if they considered themselves to be denied the opportunity to succeed, or to improve their social standing. In November 2011 the Guardian, in conjunction with the LSE, released a study largely based on interviews with those involved in the riots. While this study must be viewed as inherently self-serving and, at least to some degree, unreliable in methodology, it at least offered an alternative reading of the riots. This naturally meant its lifespan would be limited to the news cycle, as it was immediately dismissed by the authorities while the “tough on crime” juggernaut rolled on. By “a contrary path” Mulgan also means one driven by results and in keeping with the managerialist, market-based approach to the performing of government functions as adopted and promoted during the Thatcher years. This inevitably resulted in an outlook that prioritised short-term, small-scale victories, akin to those of the business cycle, over long-term, transformative achievements. James and Raine would agree: “Instead of making policy through recognized institutions within a climate of agreement and with the support of key professional bodies, the Government sought to deliver through the medium of management.” It had become less important to adopt the right policy and more important to enact that which would deliver measurable, demonstrable and immediate results. Although the Guardian may not like it, riot arrests figures and prison sentences provide exactly that. The government’s response to the riots of 2011 therefore represents a convergence of convenient forces. It is simultaneously reflective of the economic imperatives of the era, the emergence of an unsympathetic national sensibility, the displacement of expertise by managerialism and a two-decade long race between political parties to be seen in the media as the least tolerant of crime and the toughest on criminals. In such circumstances, a more liberal state could afford to do no more than a conservative one. A Labour government could afford to be no more generous or offer more compassionate solutions to these problems because they were just as complicit in the construction of a climate of punishment. Would the response have been different had the riots happened thirty years ago? In the urban unrest that characterized the 1980s, we have evidence upon which to draw. Margaret’s Thatcher’s government also condemned the riots as “criminal”. The difference, one feels, is that the political climate of the 1980s required that the government possess at least an informed understanding of the social and economic factors that contributed to the unrest. In 1981 the government commissioned Lord Scarman to author a comprehensive study into the causes of the Brixton Riots. The conclusion that they were “not pre-planned but the spontaneous welling-up of the feelings of angry young men, most of whom were black, against what they saw as a hostile police force” demonstrates an intellectual interest and an effort at engagement. This further reveals a willingness on the part of the government to understand the underlying causes, issues and grievances behind the violence, to solve them for their own value rather than merely to prevent further outbreaks. 2011’s riots saw no such efforts at engagement and, as Solomos puts it, “a strong theme in the official response to the riots has been to see them as issueless riots”. While the body politic in the 1980s was equally outraged by the immediate effects of the riots and inclined towards the punitative response it was at least not unwilling to listen to opposing views and entertain the analysis of expert bodies and experienced individuals and institutions. Thirty years on from the Brixton riots, with the distance between expertise and criminal policy comfortably wide, and no political advantage to be had from reducing it, we can expect nothing more influential than the Guardian/LSE study to emerge. The answer in 2011, which would prove populist as well as economically expedient, simultaneously satisfying the major media institutions and their audiences, was that the riots were their own cause. Rather than being a symptom of a sick culture, one which might call for a cultural remedy for which only government had the capacity to instigate, the solution lay in the communities and with the families of the rioters who had, themselves, failed Britain. Government power to punish the rioters would be maximised, responsibility to help them reduced to nil. Just as Henry Mencken declared that “no one ever went broke underestimating the intelligence of the American public”, in Britain no politician has, for the past two decades, suffered electoral disapprobation for underestimating the public stomach for punitiveness. Whether the media, the politicians or a natural shift in the public priorities is most responsible for the changes that occurred in the arena of criminal policy matters little: that a transformation took place is beyond dispute and the response to the riots was therefore pre-ordained. The Prime Minister, in his first statement as well as all subsequent ones, reached strong and certain conclusions, repeatedly referencing punishment, sentencing and individual culpability. Just two days after the first wave of violence, no more information was needed than was available. The response was set in stone.